Happy Valentine’s Day! You know I couldn’t let this day go buy without a little chocolate, right? Before we get to the chocolate, though, I have a question. Why has no one ever told me how great cake pans with super square edges are? 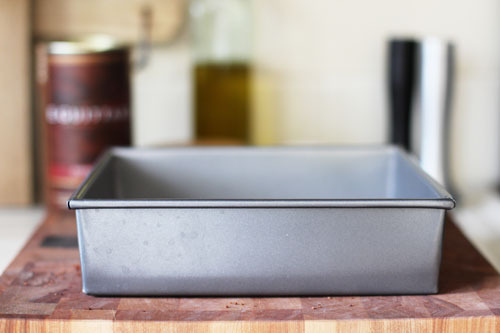 My sister Anne’s 8×8-inch baking pan has those super right-angled edges. Cate’s giraffe birthday cake this year was cut from an 8-inch square cake. I borrowed Anne’s cake pan knowing the squared-off edges would work better for cutting the pieces for the cake. 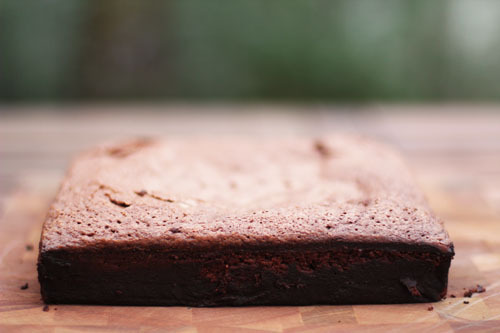 Well, the pan worked fabulously for the cake…and then, last week, I used it for brownies and loved it! I had to return the pan, but you can bet your bottom dollar I will be buying one of my own, in the 8″x8″ and 9″x13″ sizes! I’m putting the recipe here because in the past when I’ve simply linked to recipes, I’ve run the risk of the links disappearing for various reasons and forever losing recipes I love. Not that Ruth Reichl is going anywhere anytime soon…but who knows what those pesky links will do! I didn’t change anything about the recipe and I have absolutely nothing to add. Except that the recipe works beautifully as written. Ruth Reichl's "A Better Brownie"
Butter a 9x9 square pan and line the bottom with parchment paper. Butter the bottom again and lightly dust the pan with cocoa powder. Melt the chocolate and the butter in a small saucepan over low heat, stirring constantly until the mixture is smooth and glossy. Remove from heat and stir in the vanilla. Beat the eggs and salt in a stand mixer. Add the sugar and beat on high for about 10 minutes, until the mixture has turned quite white. Add the chocolate mixture to the eggs, beating on low until just mixed. Gently stir in the flour until it just disappears. Pour the batter into the prepared pan, place in the middle of the oven and immediately turn the temperature down to 350 degrees. Bake for 40 minutes; the brownies will be quite fudgy and a toothpick should come out not quite clean. Cool on a rack. Invert the pan, remove the parchment paper and invert again onto a cutting surface. Cut into squares. Thanks for the advice on the pan – I will have to try these as well. so funny, for both brownies and pancakes I always end up going back to the same recipes from my grandma and mom (respectively)…for some reason I’m always trying variations, I supposed it’s fun! but those are the old reliables. love that this recipe is so similar to your old stand-by! hope you like the pan! This recipe if from the classic “Joy of Cooking”, by Rombauer and Becker. Is there a brand on those pans? Or where do you find them? 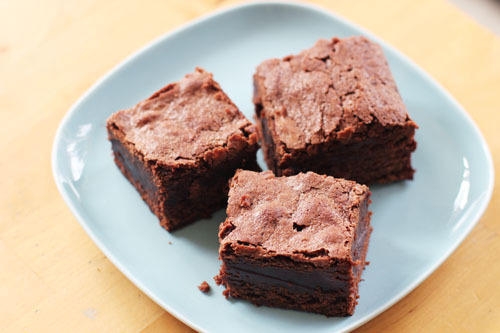 There are so many different kinds of brownies, and I want to try them ALL! I’ll definitely be trying this recipe, thanks! mmm, a good homemade brownie IS dangerous! yum! What kind of pan were you using before with your brownies? I thought all brownie recipes called for a 8X8 or 9X13 cake pan. Anyway, I will have to try out this fudgey looking recipe when I get back to the States and my mixers b/c my arms would tire out from whipping the eggs haha. They look amazing! yes, I always used an 8×8 or 9×13, but what I’m specifically referring to is the shape of the pan. the classic pans have a little bit more rounded edges around the bottom of the pan. this pan has VERY straight, right-angled edges. it worked REALLY WELL when I was cutting pieces to build a cake shape, then I didn’t have those funky curvy edges to try to fill in with icing to make it look square. does that make sense? you mentioned to use unsweetened excellent chocolate. Since the brand of chocolate makes a big difference, what brand did you use? My moms (and now my) recipe for brownies is very close to this one and never fails. I roll out some caramel and place it on the brownies whine they come out of the oven so it melts evenly over the whole pan. Then top with chocolate ( home made of course!) icing and cut it into small pieces. Probably causes a blood sugar spike directly proportionate to the ecstasy of eating them. I have been looking for a great brownie recipe. Looks like I found it. I am going to find the pans tomorrow. I will go to Bed Bath and Beyond. Thank you so much for the recipe and the pan suggestions. every time I make this recipe my husband says it’s his favorite…hope you enjoy it as much as we have! and happy pan shopping! This recipe sounds great, but to me, the real brownie flavor that I love comes from the use of brown sugar rather than white. How do others feel about this? I haven’t ever thought to use brown sugar in brownies, but it sounds like a GREAT thing to do – I will have to try that! We love black walnuts in practically anything chocolate, and though I usually try a recipe w/o change, I was under pressure (husband)to add the walnuts. Ladies…. I thought I died and went to Heaven! I am trading brownies for yardwork now, so this brownie thing has benefited me in a variety of ways! Thanks so much. This is a lot of eggs, are these “cakey” brownies or are they more fudgy? Please clarify the pan size. You refer to your sister’s 8×8 cake pan and the bed bath beyond link show an 8×8 square cake pan, yet the recipe calls for a 9×9 pan. Which size works best with this recipe? either will work. 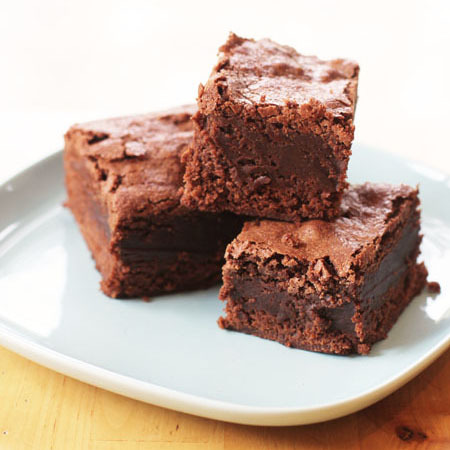 the recipe calls for 9×9, so it definitely works with that, and I’ve always used an 8×8 and they come out great – probably a little bit longer cooking time with the 8×8 since the brownies will be thicker. enjoy! So, I’m always up for brownies and these brownies looked glorious. HOWEVER, these were a tragic bust for me. I followed the directions but the center was more like delicious chocolate soup than brownies. The recipe specifically said the toothpick wouldn’t be clean. So what’s the all-done-tell? Is there cracking all across the center? Help, please! 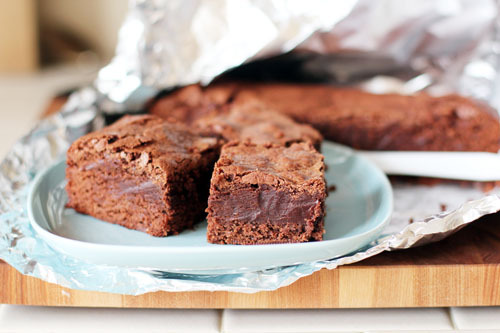 I need more glorious brownies in my life. Yes, I know I’m replying to myself. Apparently, I’m impatient for greatest. I tried again tonight with much more success. I let the brownies cook for almost 12 more minutes! Also, in a stroke of genius I used butter and granulated sugar instead of cocoa powder to dust the dish. It gave the edges a little grit, but in a really awesome way. Honest, I promise. I use a very similar recipe. One ingredient to improve the recipe is I use brandy rather than vanilla. Try it – it is lovely. GREAT tip! will have to try that!